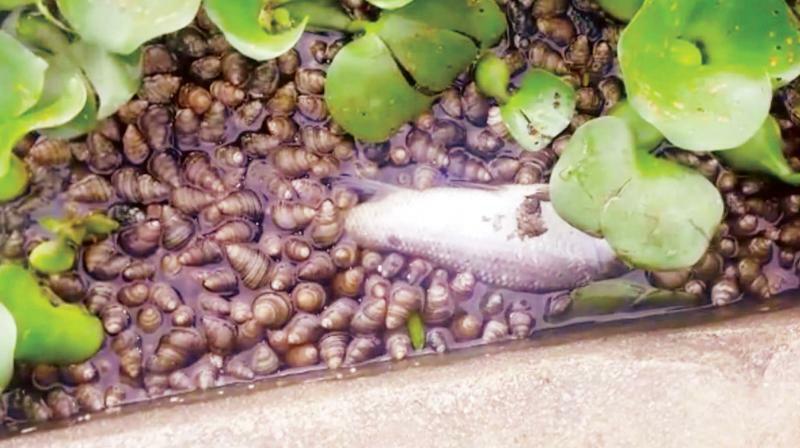 Bengaluru: On the morning of October 4 the residents on their way for a morning walk witnessed that thousands of dead fish and snails have accumulated at the periphery of the Madiwala Lake. remains a concern. As far as I know, the sewerage enters the lake from the nearby Storm Water Drain." "We were shocked to see early in the morning. Most of us believe that this could be due to the rising pollution of the water body. The scale of death reminded me of Ulsoor," said Harish, another resident of BTM. The forest department officials opined that during rain freshwater mollusks gather for reproduction. "The sewage has entered the lake, but as of now we cannot reach any conclusion. When rainwater enters the lake some survive and some do not. This is a natural phenomenon."